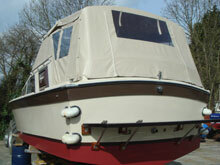 Established in 1972, Sheridan Marine have been working on local craft for over 35 years. We have built up a good knowledge and stock of boat spares and chandlery items. Boat Safety Scheme (BSS) Certification. Gas, Water & Fuel Installations. New projects, Hot Water Systems, Heating, Pump Out Toilets. Woodwork, GRP Repairs & Construction. Specialist stainless steel work, new tanks, BSS tank modifications. Well known for Freeman maintenance, many of the traditionally manufactured boats such as Birchwood, Seamaster, Broom, Viking, Fairline, Elysian, Shetland, Sheerline and Nauticus all have a similar style of building techniques and fittings, their work too can be undertaken at Sheridan Marine. 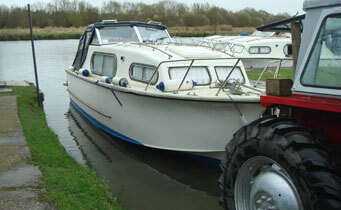 As newer boats make their way on to the river we have expanded our engine and maintenance services to accommodate. As well as Perkins, WaterMota, Thornycroft, JGM, Westerbeke, Yanmar we are also Nanni Engine main dealers. Nanni Engines are often found in Sheerline, Broom, Haines and Sea Otter craft and we are able to offer servicing facilities and spares for them. Today we continue manufacturing parts for these classic brands; maintaining the boats, engines and gearboxes. 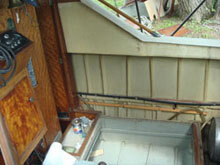 So why not bring your Cruiser in for a spring clean, engine service or re-antifoul. Projects such as a new rubbing strake, new window rubbers, a new hood or maybe a new installation such as a hot water system, a hardtop, heating or a fridge? Since 1968 we've been involved with Freeman Cruisers and their various engines. In 1985, after the Freeman factory had closed the Freeman Spares were moved down to Sheridan Marine. In 1993 WaterMota Petrol Engines and the J-Type Gearbox moved in to Moulsford. The Boat Safety Scheme (BSS) is required for most boats used on the River Thames and is renewable every four years. At Sheridan Marine we carry a comprehensive range of BSS compliant fittings and accessories to help you pass. If you fail your BSS examination we are here to help. Bring in your BSS report and we will go through it with you and provide you with the parts required. Many special fittings are made and stocked, particularly for the Freeman range, such as fuel filler hoses, fuel pipes, gas pipes, ventilators, battery accessories, fire extinguishers & fire blankets and Boat Safety Scheme compliant labels. So that you can amend your boat to the new standard without having to change from imperial sizes or make any major structural changes. For more information on how we can help with your boat projects and maintenance please phone us. 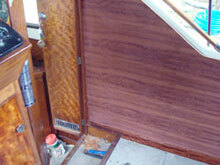 Renewal of a side panel in a Freeman 23 at Sheridan Marine.